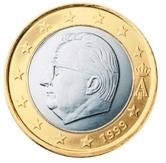 Belgian Euro coins are interesting in many ways. 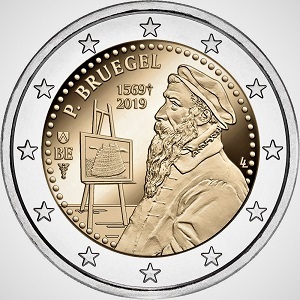 Did you know that Belgium has no less than five standard series? Or that one of its Commemorative coins is in honour of s British event? 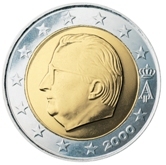 Belgium was one of the founding members of the Euro zone and started issuing coins in 2002. 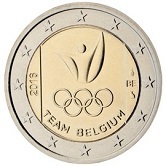 Some basic facts relating to Belgium. 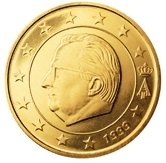 The Motif for all Belgian Euro Coins is basically the same - a portrait of King Albert II together with his royal monogram, a capital A under a crown. As King Albert abdicated in July 2013, the portrait of his son Phillipe appears as the motif in the 2014 and subsequent series. 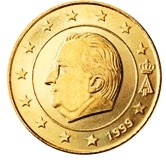 In the coins minted from 1999 to 2007 the royal monogram is shown at "three o'clock" and the year of minting is shown at "five o'clock". Both appear in the outer rim. 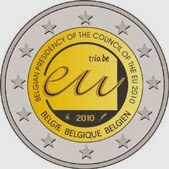 In 2008 a revised "national side" appeared in order to comply with the new guidelines of the European Commission. 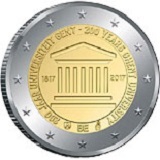 These required, among other things, that the circle of 12 stars representing Europe appear as in the European flag - i.e. continuous in a circle with nothing intruding between any of the stars. 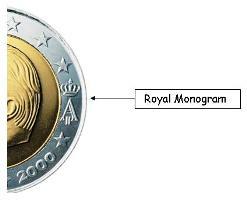 i) The monogram and date of minting were now brought within the inner circle. 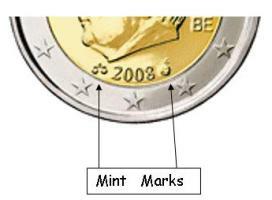 ii) The year of minting was moved from "five o'clock to "six o'clock". 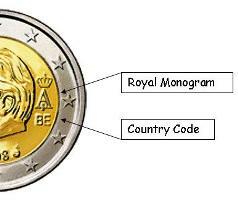 iii) The country code for Belgium (BE) now appears under the royal monogram. 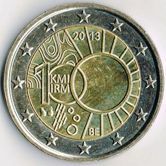 iv) Two mint marks appear to the left and right of date. 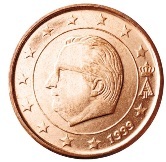 v) And finally the portrait of the king was slightly altered (to reflect several years of aging?). 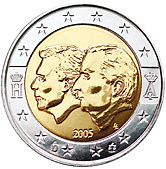 In 2009 the "national side" was again revised. The old portrait was again used (the king became younger !!) 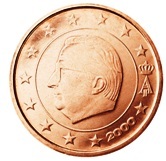 but the other changes effected in 2008 remained. As Belgium minted with the new "Common Side" from 2007, it has in effect four "Minting series". As from 2014 one must speak of five "Minting Series" as the National Side now shows the portrait of the new king Phillipe. 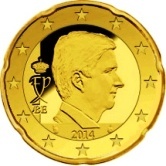 Although there is no significant change in the image on the various values, I have included all the standard coins below for the sake of completeness and to maintain a certain consistency between the various national sides. 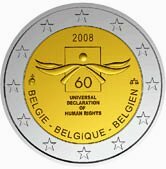 Belgian Commemorative Two Euro Coins. 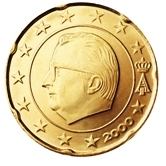 2005 - The Belgian -Luxembourg financial agreement. 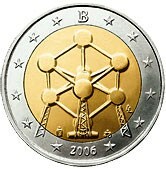 2006 - Renovation of the Atomium in Brussels. 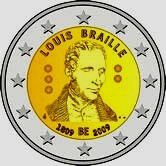 2009 - 200th birthday of Louis Braille. 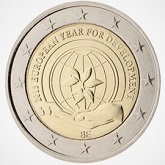 2010 - Belgian presidency of the EU. 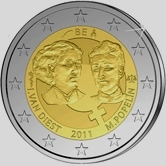 2011 - 100th anniversary of the International Women's Day. 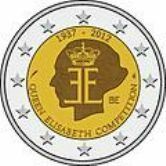 2012 - 75th anniversary of the Queen Elisabeth Competition. 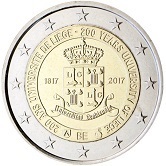 2013 - 100th anniversary of the Royal meterological Institute. 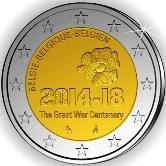 2014 - 100th anniversary of the beginning of the First World War. 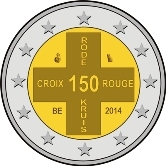 2014 - 150th anniversary of the grounding of the Red Cross. 2016 - Olympic Games - 2016. 2016 - Day of missing Children. 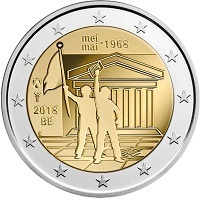 2018 - 50th Anniversary of the Student Riots in 1968. 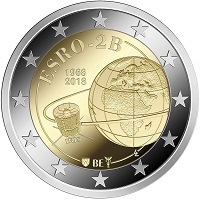 2018 - 50th Anniversary of the Belgian participation in the ESRO Satellite. death of Pieter Bruegel the Elder. 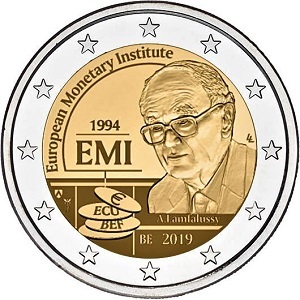 2019 - 25 Anniversary of the establishment of the European Monetary Institute (EMI). 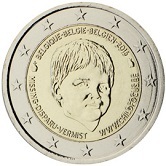 Return from Belgian Euro Coins to Links to Specific Countries. 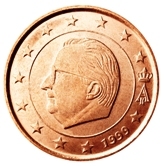 Return from Belgian Euro Coins to euro-coin-collector.